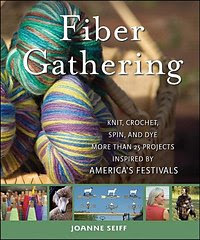 yarn spinner: Fiber Gathering Designer Blog Tour! I'm looking forward to this. Please remind us each time another interview is going to happen. I've been perusing your book for the past 2 days. It's so much fun! Makes me want to do a lot of traveling. The part on skirting a fleece alone is worth the price of the book, that scares me. And it's nice to see JoLene Treace turn up, I love her stuff. Sounds like a great tour! What a fun idea!